Tomorrow, July 24th at 8AM SL-Time (PDT) I’ll be giving a demo of the ‘Reflexive Architecture’ interactive installation I’ve been working on as an extension of the Architectural Jazz piece. In real life, we typically experience architecture and music in a passive role. The composition remains unchanged while we listen or observe. 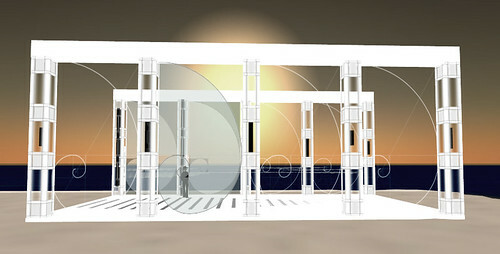 However, in a virtual environment, we have a unique opportunity to make the architecture responsive, or reflexive. The buildings can ‘know’ that we’re there, and react to our presence perhaps even remembering that we’ve been there, leaving visual or audio traces of our existence long after we’ve left. 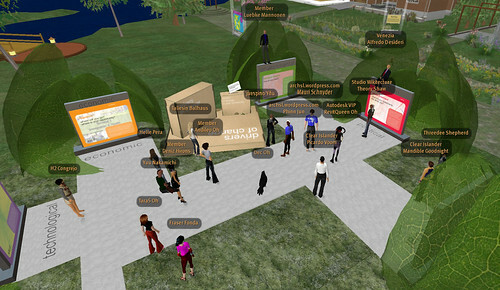 I’ve rezzed an interactive demo installation near the amphitheater that will help describe this concept. 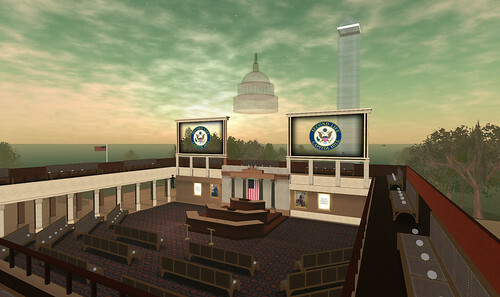 Location SLurl and event posting can be found HERE. Slideshow of the installation HERE. The cannon blast launching this competition triggered an architectural jam session! The ‘real-time evolution’ called for by the competition brief started with a few entrants immediately rezzing elements that responded to the existing context, leading to more complex responses over time. In the first few weeks of discovery and evolution, the dialogue between competitors seemed to be the most pervasive. I decided to document this phenomenon by charting avatar movement, architectural responses, and the informal discussions that were happening at the site. With this data, I wrote a piano score loosely based on these observations. 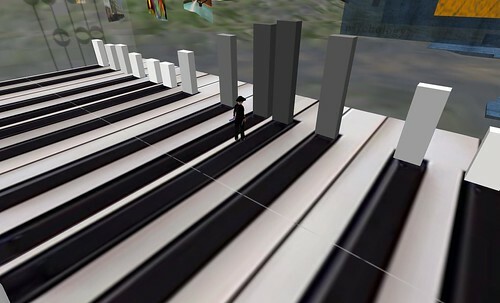 Considering the brief’s call for ‘overlap between the real and virtual worlds’, I recorded video of the subtle key movement on my real life piano and optimized it to play in Second Life. After inserting this video as part of my composition, I observed the response, feedback and reaction to the installation. It became clear there was an opportunity to create an even more direct, real-time relationship between avatar movement and the musical composition. Instead of relying exclusively on abstracted avatar movement, I collaborated with a scripter who wrote a code enabling a sound to be played and the key to change color and size upon detecting avatar presence. I then recorded three chords that were in harmony with the original score, and when combined with the script, enabled avatars to actively participate in the creation of the music and the architectural composition, establishing a more immersive mind-avatar connection. While my entry shifted shape over the course of the competition, starting off as a hyper-responsive and eclectic composition, it has evolved into a considerably refined piece, consistently relying on a steady stream of direct and indirect communication and collaborations with other contributors. Throughout the island’s evolution, it became clear that a new language of virtual architecture seems to necessitate a collaborative, cross-disciplinary approach, where no single contributor can be isolated as exclusively responsible for the final composition. It has been my stated desire from the first day of this competition to enable this emergence and dialogue to continue by maintaining Lebenswelt Island as a testing grounds and incubator for an ongoing, dynamic, and collaborative effort to derive a new language of virtual architecture in tune with the stated objectives of this competition. Given the time and a proper catalyst, truly profound concepts can emerge from this collaborative process, and I would like to see this dialogue continue indefinitely. Chris Luebkeman’s presentation on Autodesk Island was quite a unique experience! During event preparations, Chris described an idea for creating a more engaging presentation than the formal theater-style build where the audience experiences the event in a passive role. Instead, we opted for a more dynamic installation where attendees were encouraged to move around the build as Chris described each of the 5 Drivers of Change categories. The event started with Chris (avatar Leubke Mannonen) and Autodesk moderator RevitQueen Oh sitting on top of a virtual replica of the Drivers of Change box that typically serves as a give-away during real-life presentations. In this case, the box contained a HUD, created by Kiwini Oe of Clear Ink, that enables visitors to read more about each category. As Chris described each category, he moved from kiosk to kiosk, sometimes sitting down or standing on top of the kiosk as he spoke. This kind of dynamic movement throughout the presentation made it far more engaging and interactive than the typical hierarchy of audience and presenter. I think Chris did a fantastic job, and it was a real pleasure to have been able to work with him on this event, and hopefully many more in the future!